“Best of” lists help raise a salon’s profile, improve their reputation, and build loyalty among their clientele. How do these salons make the list? And how can your salon get in on the action? Between local newspapers that put out a “best of” list every year to online reviews that create a “best of” database for Internet-savvy consumers, salons owners have multiple opportunities to get their name out to the public. And the good news doesn’t stop there. Because there are often many categories that a single salon can enter — Best Salon, Best Spa, Best Nails, Best Manicure, Best Pedicure — a single salon has multiple chances to win. We spoke with some salons who made “best of” lists to see how they were nominated, and if winning a place on a “best of” list helps improve business. You might be surprised by what you learn. Type in “best nail salon” and “NYC” on the homepage of yelp.com and the two locations of Sakura Nails come up in first and fourth place. But here’s the surprise: In a city of nearly 8 million, it took only 19 reviews to put them at the top of the list. Nineteen. And because of those happy customers, Sakura Nail and Spa is the first name shoppers see when they look for nail services in New York. For a salon that has been open only three years, that’s an impressive accomplishment. Tip: It doesn’t take many reviews to get you to the top. Tip: Winning “best of” in a narrow search still makes you a winner. Some salons win the “best of” category in many different venues, as is the case with Silk in San Francisco. Boasting “Best of Yelp,” “Best of Citysearch,” and “Best of SF Weekly,” this salon gains customer loyalty with its high safety standards and commitment to cleanliness. As an added bonus, clients can get a mani/pedi combo at the same time, which reduces the appointment time while raising the luxury factor. Tip: Customers comment on the overall experience, not just on the quality of the nail service. 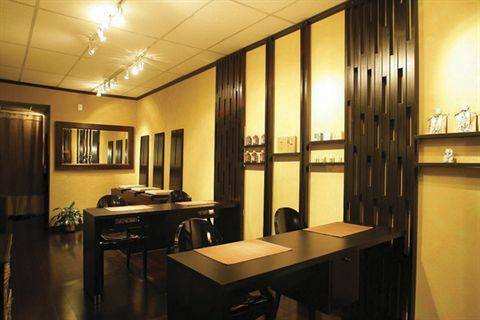 Positive comments on cleanliness, friendliness, and efficiency can bump a salon to the top of the list. Solstice Day Spa, Hyannis, Mass. Tip: Highlighting your “best of” award in your advertising elevates your salon’s status in the eyes of customers who are looking for a new salon. Joy’s Nail Salon & Spa, Washington, D.C.
Every first-time customer to Joy’s is asked how she heard about the salon. 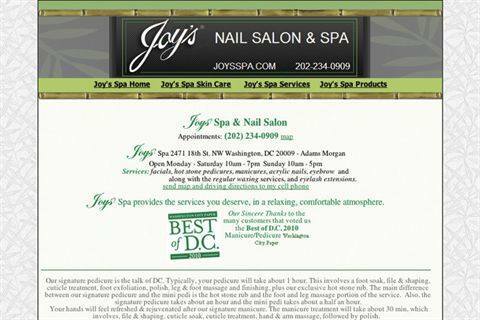 Many customers refer to the Washington City Paper, where Joy’s won in the Best Mani/Pedi category. All of the votes are customer-generated, so winning the award confirms to the owners of Joy’s that their customers are satisfied. Salon owners can alert customers when a local paper is calling for nominations for a “best of” issue. When you win a category because your customers took the time to vote, be sure to thank them for their support. Tip: The process of winning a “best of” award can build ­camaraderie and loyalty among customers. Tranquille owner Maria Butta knows the advantage of having the “Best of Citysearch” logo by her name. Located near multiple major hospitals, Tranquille has a consistent stream of potential new ­customers, either from families relocating to work at the medical facilities, or from families coming to visit. Butta takes advantage of Citysearch’s tools for business owners, which helps keep her name at the top of the list. Citysearch provided her with a sticker for the window, a plaque for the wall, and a “Best of Citysearch” graphic she can use in all her advertisements. “It ­absolutely helps improve business,” says Butta. Tip: You aren’t dependent entirely on clients’ reviews. You can increase your salon’s profile when you take advantage of the tools that sites like Citysearch and Yelp offer business owners. Butta tells the story where a first-time customer came to the salon and wasn’t pleased with her experience. “The stylist was very busy that day and didn’t take the time for a consultation before the service,” says Butta. After reading the customer’s poor review online, Butta contacted her to apologize and offered to fix the problem. The customer returned to Citysearch to update her review, this time noting the impressive customer service offered at Tranquille. Tip: Techs and business owners have the opportunity to ­reverse poor reviews and increase their ranking through positive comments. Business owners can proactively pursue being nominated for a “best of” award. Contact local publications to find out if and when they run a “best of” contest, and ask how businesses are nominated. Display the information in the salon. In a similar way, business owners can use online sites to increase their salon rankings through customer reviews. Chantelle Karl, ­public relations manager for Yelp.com told us the “best of” section is based purely on rating and number of reviews. While it’s frowned upon for business owners to solicit reviews from customers, Yelp suggests posting some of the Yelp reviews in the salon so customers know to find you (and review you) on Yelp.